A United Launch Alliance (ULA) Atlas V rocket carrying a payload for the National Reconnaissance Office (NRO) lifted off from Space Launch Complex-3 here at 2:39 p.m. PDT today. Designated NROL-36, the mission is in support of national defense. Todays successful launch of the NROL-36 mission occurred on the same day as the national memorial service honoring American hero Neil Armstrong. The scientists and engineers developing and operating these remarkable current-day launch and spacecraft systems reflect Neils incredible legacy to mankind, said Jim Sponnick, ULA vice president, Mission Operations. ULA launched NROL-25 April 3 from Space Launch Complex 6 at Vandenberg Air Force Base in California, as well as NROL-38 June 20 from Space Launch Complex 41 and NROL-15 June 29 from Space Launch Complex 37 both located at Cape Canaveral Air Force Station in Florida. This mission was launched aboard an Atlas V EELV 401 configuration vehicle, which includes a 4-meter diameter payload fairing. The Atlas booster for this mission was powered by the RD AMROSS RD-180 engine and the Centaur upper stage was powered by a single Pratt & Whitney Rocketdyne RL10A-4 engine. In addition to the NROL-36 payload, 11 CubeSats took advantage of available volume and structural capacity of the Atlas V launch vehicle for a ride share. The NRO and ULA partnered to develop an Aft Bulkhead Carrier (ABC) on the Centaur second stage, which is a platform for accommodating auxiliary payloads aboard Atlas V missions. Affixed to the ABC was an auxiliary payload called Operationally Unique Technologies Satellite, or OUTSat, carrying the 11 CubeSats in various configurations. The CubeSats are sponsored by the NRO Mission Support Directorate and NASAs Launch Support Program, and were developed by the Space and Missile Defense Command, The Aerospace Corporation, University of Southern California, University of Colorado, California Polytechnic State University, Morehead State University, University of California Berkeley and the Lawrence Livermore National Lab. Developed by the United States Air Force to provide assured access to space for Department of Defense and other government payloads, the commercially developed EELV Program supports the full range of government mission requirements, while delivering on schedule and providing significant cost savings over the heritage launch systems. ULAs next launch is the Delta IV GPSIIF-3 mission for the United States Air Force scheduled October 4 from Space Launch Complex-37 at Cape Canaveral Air Force Station, Florida. Encompass Government Solutions, a division of Encompass Digital Media, has been awarded a contract to become Inmarsats satellite access station (SAS) in support of the new Global Xpress® constellation. As one of two North American co-primary Teleports, Encompass will provide uplink/downlink services, collocation of Inmarsat equipment and interconnectivity to Inmarsats terrestrial data networks. This next-generation, Ka-band satellite fleet offers high throughput with downlink speeds of up to 50Mbps and up to 5Mbps over the uplink from compact user terminals. The Global Xpress launch program commences in 2013 and a third launch is scheduled for 2014. 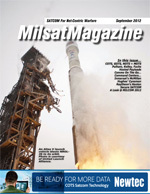 Inmarsat required a secure site that provided an optimum environment with minimal disruption risks, such as extreme weather conditions; and Encompass Lino Lakes, Minnesota, facility renders a unique geographical location for radio frequency communication. Encompass will be supporting Inmarsat by collocating and managing a significant array of satellite ground segment equipment and routine maintenance services for a new 13.2m Ka-band antenna. Encompass services will include a newly constructed 2,500 square foot cement building which will house equipment to manage, control and provide service to Inmarsat Global Xpress customers. During the long-term contract, Encompass will provide SAS services pre-launch and throughout the life of the Global Xpress fleet in addition to 24/7/365 hot hands engineering and facilities support at the antenna hub. SES Government Solutions (SES-GS) has been awarded a Custom SATCOM Solutions (CS2) contract. The contract has been awarded to eight companies and has a total funding ceiling of USD 2.6 billion over a base period of three years with two additional one-year options. With this award, the U.S. Government will be able to contract directly with the global satellite operator to obtain mission-tailored communications capability and solutions on SES fleet of 51 communication satellites. ATK has been selected as a key participant to support the U.S. Defense Advanced Research Projects Agency (DARPA) Tactical Technologies Office (TTO) Phoenix Technologies Program. The Phoenix Program is developing technologies to cooperatively harvest and re-use valuable components from retired, nonworking satellites in geosynchronous orbit. The planned repurposing of these satellite components, such as antennas, represents the potential to create new space resources at significantly less cost. The DARPA Phoenix Program system integrator, the Naval Research Laboratory (NRL), has issued a solicitation announcing it intends to negotiate with ATK to modify an existing U.S.-built, U.S. government owned geostationary satellite bus for the Phoenix mission. NRL has identified ATK as the only responsive source for this service. The bus, originally developed by ATK, is designed to be capable of supporting, for a minimum of one-year, robotic rendezvous and proximity operations, and a grapple-and-repair robotic technology demonstration mission. The bus is scheduled to be delivered by October of 2014 to the NRL for Space Vehicle integration and test. ATK has also been selected for a contract award in response to a Broad Agency Announcement (BAA) from DARPA for the Phoenix Technologies Program for the primary robotics effort. ATK, in partnership with the University of Marylands Space Systems Laboratory (SSL), will develop robotic servicing tools and software to enable re-use of the antenna and other working components of a nonfunctional satellite. ATKs hardware is comprised of a Satellite Capture Tool (SCT) and an Aperture Grasp and Severing Tool (AGST). These tools provide applications for satellite grappling and control as well as salvage operations. In addition, ViviSat, a satellite life-extension service owned by ATK and U.S. Space LLC, continues its development and is synergistic with DARPAs vision of sustainable satellite servicing. The goal of the Mission Extension Vehicle (MEV) is to robotically dock with satellites not designed for on-orbit servicing, extending the mission of the client spacecraft by one to 15 years. Combined with ATKs new state-of-the-art Robotic Rendezvous and Proximity Operations (RPO) Lab, these services provide the tools to leverage DARPA-developed technologies and adapt new capabilities to specific commercial and military customers. ATK Space Systems Division Vice President and General Manager Tom Wilson said, Our existing expertise in spacecraft bus technology and robotic satellite servicing tools is a significant asset towards helping the DARPA Phoenix program achieve mission success. We have established a highly successful record of delivering servicing tools in support of the Space Shuttle, the Hubble Space Telescope Servicing Missions and the ongoing NASA Robotic Refueling Mission. ATK has flown more than 140 tools in space over the past two decades that have enabled human and robotic servicing of spacecraft and continues to maintain its position at the forefront of satellite servicing tools and technology development. The Phase 1 of the BAA primary robotics contract period is 14 months with a value of $1.7M. The Defense Weather Systems Directorate is celebrating 50 years of the Defense Meteorological Satellite Program. On August 23, 1962, the National Reconnaissance Offices classified Program 417 launched its first successful low altitude cloud imagery satellite into space and began a new era of military satellite weather. In the mid 1960s, the program was transferred to the Air Force Systems Command, and today the program continues under the leadership of the Air Forces Space and Missile Systems Center. The program has transformed over the years from a spin stabilized satellite with a video camera, to a robust 3-axis stabilized spacecraft with precision sensors. Currently, DMSP holds the record for the longest running satellite program in SMC history. DMSP has been collecting weather data for military operations for five decades, and over time has perfected the satellite and sensor design and operation. The current constellation consists of two operational satellites in polar, sun-synchronous orbits at approximately 458 (830km) nautical miles. The current version of DMSP (Block 5D-3) consists of a suite of eight different sensors. The primary sensor, the Operational Linescan System, provides visual and infrared imagery for cloud depiction and forecasting. The other terrestrial sensor on board, the Special Sensor Microwave Imager/Sounder, gathers microwave signals from the Earth and can detect sea surface winds, rain-rate, temperatures and humidity. DMSP also hosts a suite of five space environment and space weather sensors that detect high energy particles in the spacecrafts vicinity, magnetic field lines, ultraviolet emissions and airglow profiles. One of the keys to DMSPs long history of success is its supportive community of experts. The primary command and control of the satellite is jointly managed by the National Oceanographic and Atmospheric Administration (NOAA) and the Air Force 50th Operations Group Detachment 1. Both organizations operate out of the Satellite Operations Control Center in Suitland, Maryland. Operations are also supported by a back-up facility located at Schriever Air Force Base in Colorado Springs, Colorado, under the leadership of the 6th Space Operations Squadron. All DMSP data is sent to the Air Force Weather Agency for processing, modeling and forecasting. AFWA has a key role in generating and distributing critical DMSP weather products to forces in the field. Data also is sent directly to the Air Forces Navy partners at the Fleet Numerical Meteorology and Oceanographic Center and to NOAAs National Geophysical Data Center. DMSP maintains an effective working relationship with its industry partners. The satellite bus is built by the Lockheed Martin Space System Company in Sunnyvale, California, while sensor support is managed by Northrop Grumman Electronic Systems. The Aerospace Corporation plays a critical role in assisting the government with technical expertise and experience. The U.S. Special Operations Command (USSOCOM) is using L-3 GCS Hawkeye III Lite 1.2M and Hawkeye III 2.0M VSAT terminals equipped with iConnex e800 satellite router boards from iDirect Government Technologies (iGT). These products will be used to support the Special Operations Forces Deployable Node-Family of Terminals (SDN-Lite FoT) program. The iGT iConnex boards are smaller in size and support data, voice and video connectivity in highly mobile military applications, including mobile platforms carried by forward-deployed troops. The boards feature high-speed data transmission, increased bandwidth capacity and higher network availability. Globecomm Systems Inc. has been awarded various infrastructure contracts from U.S. Government Agencies valued at $5.9 million. Globecomm anticipates the completion of these contracts in the Companys fiscal year 2013 fourth quarter ending June 30, 2013. Globecomm provides satellite-based, managed network solutions with a suite of system integration, system products, and network services, and an integrated approach of in-house design and engineering expertise combined with a global network and 24x7 network operating centers. These are now available to vertical markets, including government, wireless, media, enterprise, and maritime. Sir Martin Sweeting, Executive Chairman and founder of Surrey Satellite Technology Ltd (SSTL), accepted the 2012 American Institute of Aeronautics and Astronautics (AIAA) Space Systems award for the Disaster Monitoring Constellation (DMC). The award, which was presented at the AIAA Space 2012 conference and exhibition at the Pasadena Convention Center in California, recognizes outstanding achievements in the architecture, analysis, design, and implementation of space systems. The SSTL subsidiary DMC International Imaging Ltd. (DMCii) was established in 2004 to coordinate constellation imaging for humanitarian and commercial needs in partnership with the constellation members. DMCii works with the worlds Space Agencies and the United Nations (UN) under the International Charter for Space and Major Disasters to provide multi-spectral optical imagery during natural disasters and has assisted relief efforts for disasters such as Hurricane Katrina in 2005, the Wenchuan earthquake in 2008 and the Japanese Tsunami of 2011: it has responded to more than 170 Charter requests for disaster imagery. The cost effective DMC small satellites and shared infrastructure provided a springboard for countries such as Algeria and Nigeria to establish their national space programmes and harness Earth observation to map and monitor resources and their environment. By working together the constellation provides the ability to image any point in the world on a daily basis, which has proved equally valuable for disaster relief, agriculture and precision farming, or detecting illegal logging in the Amazon rainforest. Sgt. Brian Craven and Sgt. Rachel Reeves, Multichannel Transmission System Operators for Bravo Company of the 146th Expeditionary Signal Battalion, conduct system checks on a Satellite Transportable Terminal during the Vibrant Response 13 exercise held at both Camp Atterbury Joint Maneuver Training Center and the Muscatatuck Urban Training Complex. Soldiers of the 146th ESB are responsible for providing communication capabilities between military and civilian agencies responding to a simulated terrorist attack during the Vibrant Response exercise.